Inflatable stand positions iPads, Kindles and other eBook Readers, tablets and traditional books for easy viewing. Use it on your lap in any chair or recliner, perfect for use in bed, use on a desk or table or fits perfectly on an airline tray! I was able to check out the a BookWedge for myself. I love to read, and to some I am stuck in the dark ages. I do not have an e-reader and I stick with real physical books (Gasp!). But books were always a big part of my life, and they still are. I will read just about any type of book, mystery, drama, sci fi just about anything as long as I am reading something I am happy. I love to read in bed especially, it is a great way to relax after a long and stressful day at work. The BookWedge is so very easy to use, all you have to do is blow it up (if you are unable to blow this up yourself, you can also use an air pump to inflate the wedge) and prop it where you would like to read and the BookWedge makes reading the book so much easier. You no longer have to hold you book up, hurting your wrists, and with the BookWedge it is much easier to see the pages than having the book lie flat. And if you would like to travel with your BookWedge all you have to do it deflate it and it is flat and small and ready for travel. This would also be great for reading on the airplane, and I will surely be bring the BookWedge on my next trip to Disney World. I was also fortunate to be able to check out the WondaWedge as well, this is an Inflatable Reading Pillow. This great pillow can also be used at the beach to lounge. My daughter was using the WondaWedge as a pillow to relax and play her video games, she just loved it! Saying it was soft and squishy and comfortable. I can’t wait to try it at the beach next summer. The pillow is a great size, but after it is deflated it is small and would fit in a beach bag easily. The WondaWedge retails for $24.00. 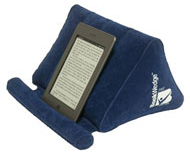 If you have an avid reader on your holiday list this year, I would recommend a BookWedge, it will make reading easier and it is great for physical books and electronic book devices. 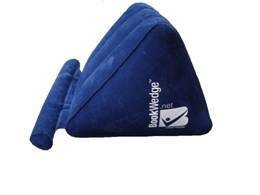 The BookWedge is priced at $19.99 this would make a great stocking stuffer! The generous folks at the BookWedge are giving one of Susan’s Disney Family readers a chance to win a BookWedge! Would you like to win? Please let me know who would love to have this BookWedge? There are also other ways to enter please enter below. Disclosure: The reviews and or opinions on this blog are my own opinions . I received 2 wedges to review. No monitory compensation was received. I was not required to write a positive review. Your experience may differ. The opinions I have expressed are my own I am disclosing this in accordance with the Federal Trade Commissions 16 CFR Part 255: Guides Concerning the Use of Endorsement and Testimonials in Advertising . This would be so perfect for my brother or my husband. My fiance would love this! He reads in bed every night. I really need this! But I would probably give it to my hubby because he tries to read in bed most nights, and it causes him awful neck pain. This would be for me, I read a lot so this would sure come in handy. since I have RA, this book wedge would help me a lot. My sons and I all would use this. Me and my husband would love this book wedge. My son would love the Book Wedge. My husband would benefit from this the most but I would love one too! I would love it, I read A LOT with my kindle. My mom would love it.